MZ Game Studio builds popular mobile games for a global audience, and they have created some of the most successful games in mobile gaming; including Game of War - Fire Age, Mobile Strike, and Final Fantasy XV: A New Empire. 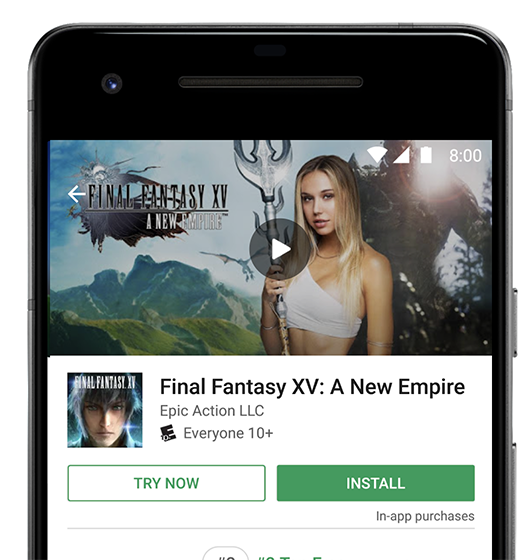 They built and launched an instant version of Final Fantasy XV: A New Empire, which you can play by clicking the "Try Now" button on its Play Store listing. MZ's team created a unique onboarding experience for Final Fantasy XV: A New Empire. They built their instant experience around the dungeon crawling feature from the full game. Through the instant app version, players can earn currency to then redeem in the full game once installed. It was straightforward for MZ to build their instant version of Final Fantasy XV: A New Empire as the instant apps framework enables developers to reuse their existing Android SDK or native code to build their instant experiences. Leveraging this platform, MZ saw an increased number of downloads from players experiencing the game for the first time through "Try Now." Additionally, MZ believes the instant game experience will be a key component of their user acquisition strategy in the future.